Vegetables take a backseat to growing monsters in this time-sucking farm sim. If it's possible to describe Zombie Farm without referring to Plants vs Zombies, FarmVille, or one of those life-absorbing Tiny Tower titles then I'm really not sure how you do it. It's also one of those games that's great to play but awful to review. You set aside a nice quiet amount of time to go deep into the game, before realizing that it's one of those crop-growing simulations that you're going to have to juggle with other tasks, in-between glaring at your iPad to see if the timer's expired. Not just another farming sim thank goodness. This is zombie farming. 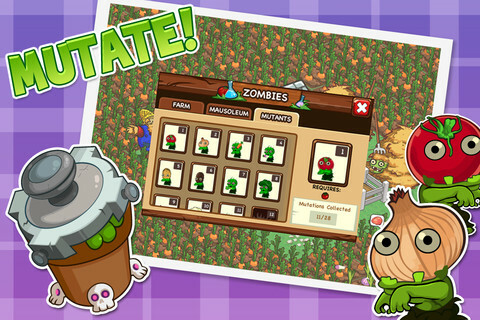 I have to confess I hadn't played the first Zombie Farm so I hope you'll forgive me if we go over some of the basics. Starting out with a humble patch of land, you gradually expand your land ownership in order to plant crops (which grow in real, boring work-time), before you harvest them to make some nice cash and experience. So far, so FarmVille. 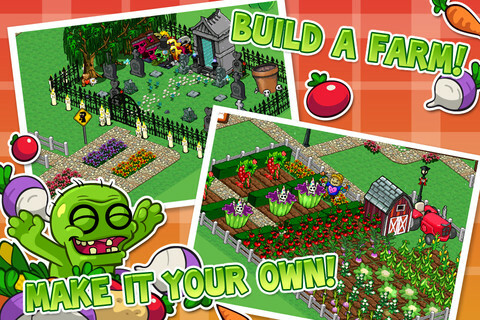 Zombie Farm's rather fun little twist is that you have to experiment with growing different types of zombies alongside the duller tomatoes and carrots of the world. Once you've assembled your army of the undead, you embark on invasions against other local farmers, at which point a rather odd mini-game plays out. As each of your zombies lurches towards, for example, poor Old MacDonald, you're required to tap on their thought bubbles until they get brains on the brain like a good zombie. You then rinse and repeat with the others as they lurch ahead and hopefully overwhelm your opponent. It's hard to shake the feeling that it's a rather directionless and pointless system of combat, and one that feels shoe-horned into the game for the sake of differentiation from every other farm-sim-with-a-twist. The invasions are more gameplay oddity than entertainment. It's disappointing that very little use has been made of the iPad's generous screen size, and so if you're even slightly fat-of-finger then you'll have to do some fiddly tapping to close down windows. Equally, it's hard not to be annoyed by in-game notifications that you believe are about to guide you to your next objective, but instead serve to hawk another of the developer's games. 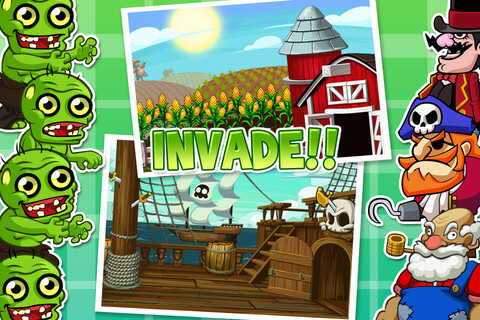 Tap the button after the delay and you're whizzed off away from Zombie Farm and on to the app store. Annoying. For veterans of the online farming sim, it really shouldn't come as any surprise to learn that the ever-present threat of in-app purchases lingers over the gameplay, and the draw of these becomes ever stronger as you approach the invisible wall that separates you from further progress. Don't get us wrong, there's fun to be had from this game, it's just not a title that we felt compelled to check in on after a certain point. Nobody panic, there IS an in-app purchase system available. It's a tricky game to sum up overall. As a member of the farming-sim cash-grab genre, it's no more or less offensive than any other of its kind. It's also a pretty and well-executed game, with an equally likeable soundtrack and plenty of good humor. If you're happy playing these sorts of games, you'll be wondering what on earth the fuss against them is and Zombie Farm 2 is for you. If, on the other hand, you're more cynical about gameplay design, there's little in this game to convince you that this brave new world of gaming is worth changing your mind over. What's Hot: It's certainly a different proposition to the usual farming sim and we liked the music, style and variety of crops. What's Not: Expensive in-app purchases that fast become unavoidable if you're to retain any interest in the game.